TREE ROOTS often grow beyond the dripline. *Most roots seldom grow deeper than three feet. *Woody roots support the tree and store energy reserves. *Non-woody roots absorb water and essential elements from the soil. *Non-woody roots are often associated with beneficial fungi (A). *Fertilizers provide elements that may be low or lacking in soil. *Fertilizers can be helpful when essential elements are lacking in soil. FERTILIZERS ARE NOT TREE FOOD. YOU DO NOT FEED A TREE WHEN YOU ADD FERTILIZERS. Tree food - SUGAR - is made by living leaves and needles. Keep leaves and needles alive and healthy so they can make food. 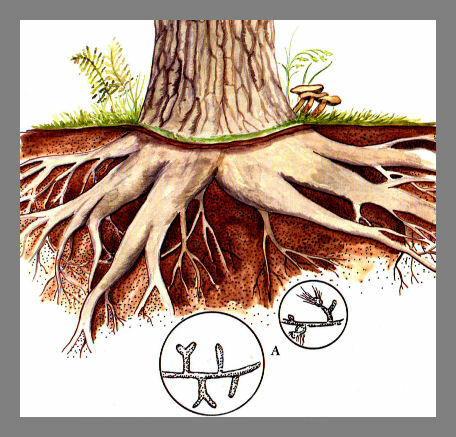 CONSTRUCTION INJURY AND SOIL COMPACTION are major KILLERS of tree roots and beneficial root fungi. Salt and misuse of herbicides are also killers of roots and fungi. DEVELOP TREE PROTECTION PLANS BEFORE CONSTRUCTION STARTS AND TREE TRUNKS AND ROOTS ARE INJURED.